You are a successful Yoga Teacher. Now it’s time to make more money. I know how hard it is to make enough money as a Yoga Teacher. There is only so much you can charge and so many hours you can teach. You love it, though, and keep going even though it is hard to make ends meet. Exchanging time for money, the business model Yoga Teaching is based on, is the worst model out there. Get sick? You don’t get paid. Want a vacation? You don’t get paid. Need to take care of someone in your family? You don’t get paid. And, sometimes, YOU have to pay someone to teach your classes. Young Living is a Network Marketing business & Network Marketing IS a better way! 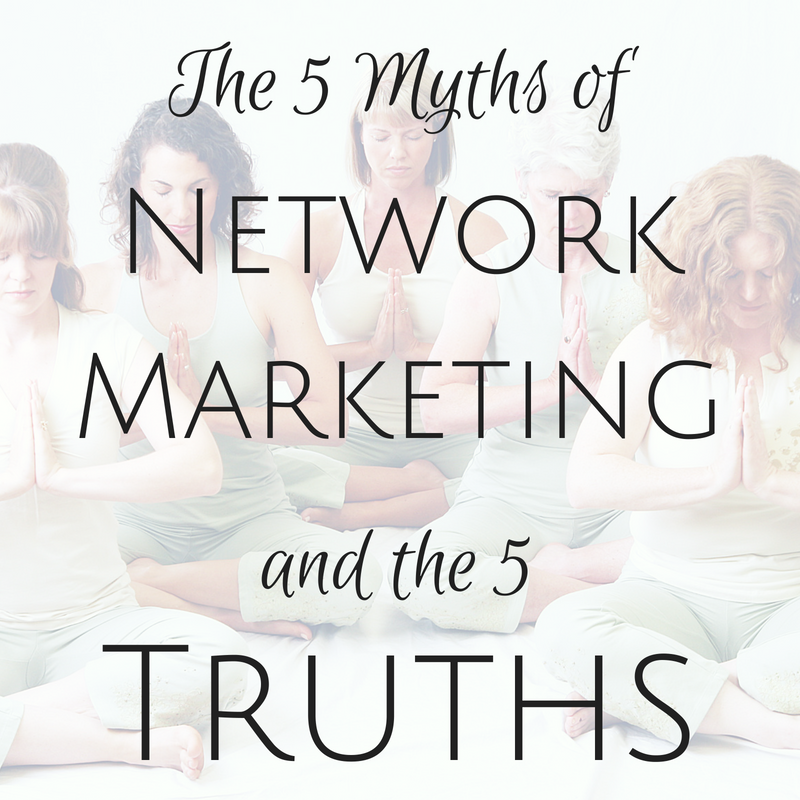 So much is misunderstood about Network Marketing. Let us help you learn more so you can make an educated decision about your financial future. Success! Check your inbox for your confirmation email! Yoga Teachers make more money. Teaching a zillion classes a week. Specializing in a niche to teach higher return workshops. Or you have a full-time job that pays the bills. Most of us wonder how we could make a living teaching yoga. you could teach yoga full-time (with as many classes as you want to teach, not have to teach) without worrying about money? you were covered financially should you get ill? Or need to care for a family member? Or want to take a vacation? you could build a prosperous future for you and your family? A sound retirement? you could create college funds for your kiddos with your teaching position? you were joining a community of like-minded people who understood your needs? you were in business for yourself but not by yourself? Would you want to, at the very least, learn more? IS a better way for yoga teachers!! Simply an opportunity to educate yourself on something that could make all the difference in your family's life and yours. “I have been a full-time Yoga Professional for over 25 years, supporting a family of four for almost 15 of those years. I know how hard it is for a Yoga Teacher to make enough money to make ends meet. 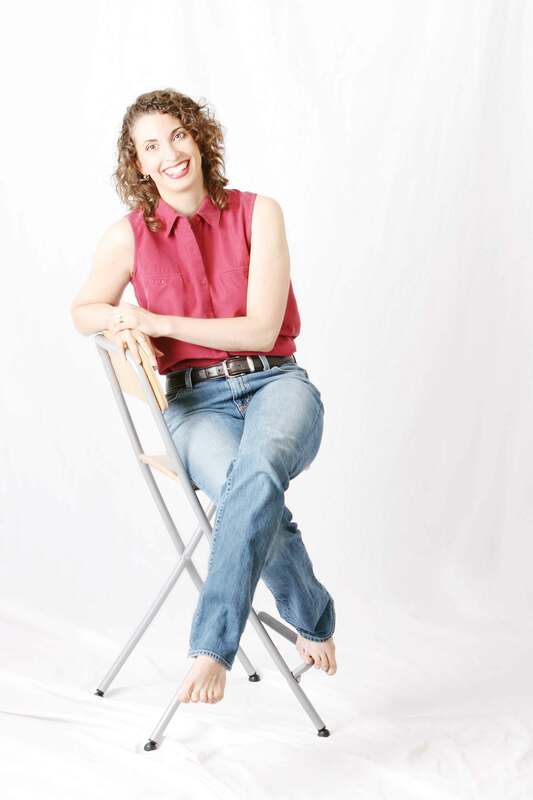 “Over the years, I have done many things to make ends meet, to create extra revenue streams: owned a yoga studio; taught, wrote and directed 200- and 500-hour yoga teacher trainings; wrote four books, led retreats all around the word; authored many blogs, radio shows and podcasts. My income would surge and then plummet. I was looking for a stable income. Isn’t it worth it to work hard doing something that can give you an amazing future? There is a reason our tagline is "The business you never knew you always loved!" As Entrepreneurs know, a new start-up is costly, hard to get going and you shouldn’t expect to profit for 2-3 years at a minimum. Just $160 for the starter kit (which is a set of oils and diffuser for you to enjoy!). My yoga studio had a start up cost of $50,000 to open the doors and another $80,000 over the next 2 years. And that doesn’t include the fact that I didn’t pay myself monthly for 3 years. None. You get the kit and enjoy the products. Want to walk away? You can. Anytime. No lease, no contracts. Just $100 a month – and that is in product. You get to enjoy the Young Living products and you should! You will want to share your passion for these amazing products and their benefits with others. My studio had an overhead of $8,000 a month. All you need to start this business comes in a box the size of a shoe box. You have a proven product, a proven system and everything you need literally comes in that single box. You are ready to enjoy the oils for yourself and start sharing with others. That means you will get paid even if you do nothing. My first “a-ah” here was the third month I was sharing the oils. I had already signed up 10-12 product lovers and a single business builder. I didn’t do anything that month because I had several yoga programs I was working on releasing. I still got a check for $86.25. Yep, amazing. Of course, now my check is much larger and covers all of my household expenses. Can you say “exhale”? AND this residual income is willable! Not only will it follow you through retirement (have you worried about your retirement plan? ), you can pass the income on to your loved ones! This alone should sell you. Wrap your head around an income you gift! While other entrepreneurial endeavors may offer this benefit, it depends on if you do any business in your home. This business is very home-based so you can deduct a percentage of MOST of your household expenses. Travel to see your college roommate? Or family? Or maybe you are on vacation and end up talking about the products with the uber-driver or wait staff or the manager of your B&B, you can now deduct a percentage of your travel. So often Yoga Teachers are an island. We don’t have a community we can feel part of. With our team, not only are you joining an active and vibrant team, you are joining a team of fellow Yoga Teachers with the special needs we have. Young Living is the world leader in essential oils and non-toxic products, a perfect fit for yoga students. They are already excited about natural living. A product the people in your community would enjoy. Because of the nature of yoga, people tend to be drawn to products that support natural living. Essential oils are a good fit, of course, and Young Living has many more products as well: personal care, supplements, household cleaners, and so much more. They are the cleanest products I have ever found. These products are also infused with the purest essential oils on the planet. Not only are they clean, they support your body systems as well. Young Living teams are everywhere. Realize that whomever you sign up with is your business partner. Can they help you reach the earning potential you desire? Do they have the training to support you? We do! We are Yoga Teachers and Yoga Studios. We understand your struggles and your dreams. We are focused and having fun building our businesses together. Sign up with us if you want to reach your potential. We know you could sign up with your Aunt Tilly or your friend Jane. But we understand you. We believe in you. We know you could really do this business, you just need a tool kit, a game plan. We have the strategy. We can help you take the next step. Really want to do this business well and possibly make it big? You need a partner who can take you there. We recommend things we love ALL THE TIME! We talk about the products we love, movies we’ve seen, restaurants we enjoyed, our favorite massage therapist or chiropractor. Whenever we share what we love, someone benefits monetarily. Why not recommend something that gives you the thank you check? Can you make money at this? In fact, there is an unlimited income ceiling. 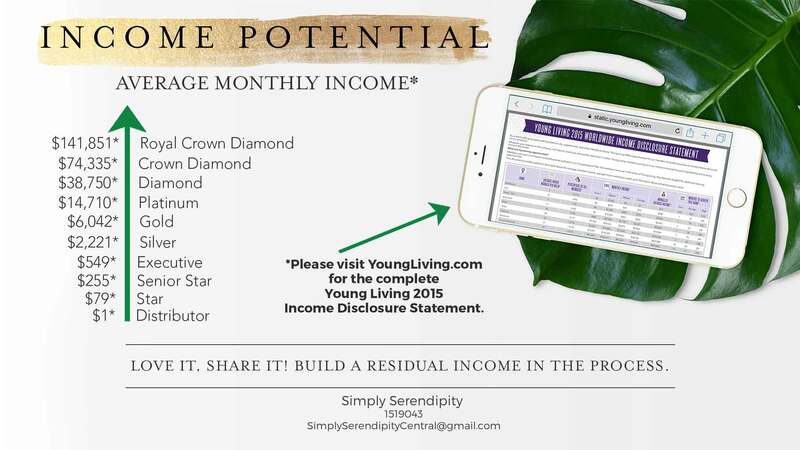 These are actual, average, Young Living income sources at each rank level. They are monthly incomes. Monthly. Have questions? Here are a few I hear the most. Have questions not covered here? We want to answer your questions personally. Just click on the button above to share with us your name and email. Reply to the email to set up a time to chat. Is this one of those "Pyramid Schemes"? A Pyramid Scheme was a business model popularized in the 80s. It is illegal. Network Marketing is a viable and legal business structure. What if I am not a sales person? First of all, good. Nobody wants to be “sold” to. As a Yoga Teacher, you are an educator. Find a product you are passionate about and tell people why you love it so much. You already share products you love. Let them decide if they want to use it. I am not comfortable making money off of my students. That’s just silly. You make money off of your students when you are teaching them. You deserve a “thank you” check when you share a product you love. Is it true succeeds at this business? Actually, Network Marketing has made more millionaires in the last 5 years than any other type of business. People may fail at the business, but the business is not a failure. Teaching Yoga, exchanging time for money, is the worst business model. Yep, I know, it’s hard to hear. But we need to be honest with ourselves and it’s true. Teaching yoga, whether it is privates, retreats, workshops, the only way you get paid is by teaching. What happens if you get sick? Or injured? Or have a loved one who gets sick? You don’t teach, you don’t get paid. Period. We won’t give up teaching, but we do need to be smart around it and develop smarter revenue streams. Wrap your head around this one; it’s potent. Residual income. That means you earn it even if you don’t work. Do you have a plan for a crisis? Or a sabbatical? Or simply a vacation? You create a team of people who are building their businesses or simply enjoying the products even while you are sleeping. Can it really fund my retirement? That income can take you into retirement, depending on the company. Young Living’s income will continue and can be willed to your benefactors after your passing. Is it just a get rich quick scheme? It’s not easy. You will work hard. But you will work hard at anything you do. Isn’t it worth it to work hard at something that will be building a financial foundation for you? Can anyone really do it? Yes, it’s true. Find a product you love and you won’t be able to stop sharing it with others. BUT you have to be willing to be coachable, keep going if it feels hard and a dose of entrepreneurial spirit helps. Is there really no income ceiling? None. You can earn as much as you choose to build up to. Want just a bit more money each month? You can do that? Want financial freedom? Yep, that’s possible, too! and your financial future to find out a little more? There is no commitment to the next step. We just want to help you learn more so you can make an informed decision about this business. We would love the opportunity to speak with you, too, and answer your questions personally.